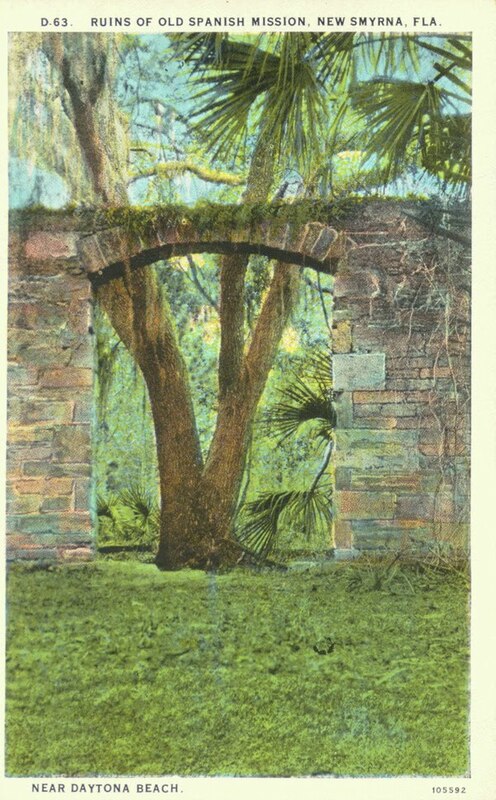 I've passed the sign many times without turning to see what the Sugar Mill Ruins were all about in New Smyrna. 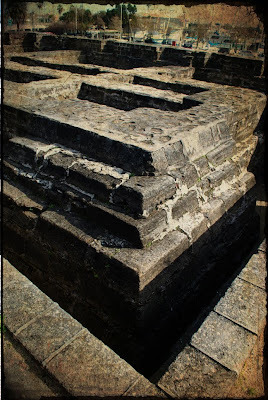 But on my 'archeological' excursion recently, I decided it was time to check them out. A small one lane dirt (mud) road leads to the ruins which are smaller than those in Ormond. Two things struck me about this site. First the interpretive signage was really good - lots of great information presented very clearly with well designed graphics. The signs were the result of an ECHO grant, which is Volusia County's way of supporting culture. I'm much impressed with the job they do up there, and I've seen evidence of these grants put to use for art exhibits, educational programs and historical displays. Good job Volusia County. 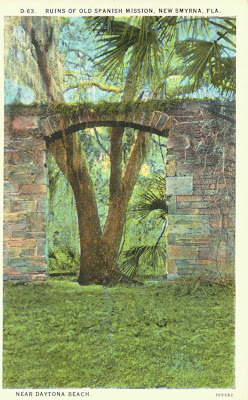 The second thing that struck me about the Sugar Mill is, like the large ruins of the Bulow Plantation, these facilities was destroyed by the Seminoles during the Seminole Indian war. There is so much awareness of the conflicts with western native peoples; everyone's heard of Custer's Last Stand, Geronimo, or the Trail of Tears. But there seems to be little awareness that Florida was the front line of the battle against native people by settlers pushing into this tropical wilderness. I think one could easily live here and be unaware that skirmishes were fought practically in their own backyards. 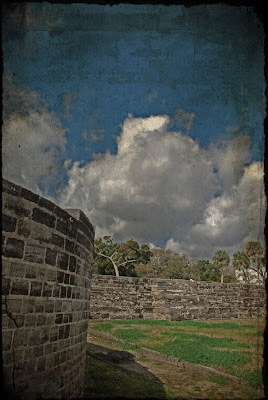 I live about 2 miles from the location of a fort built during this period, and its presence is one of the main reasons Orlando even exists as a city. The only lasting reminders of this time are these stone relics of a thriving industry that was shut down because of war. Fascinating. We live within walking distance from a great old cemetery with a big old dead pine tree in the middle with an eagle's nest on top. We've watched from a distance as the breeding pair raised eaglets, bringing them food and later standing by as their young tested their wings before leaving the nest. The last two years, however, the nest has been knocked out of the tree by strong winds and this year two young eaglets came crashing down to earth with it. Fortunately Central Florida has the Audubon Center for Birds of Prey in Maitland and the young birds were taken there for 2 weeks of rehab before they will be returned home. So on this first day of spring, Mrs. Ephemera and I decided to visit the center and were very pleased we did. The Center was started in 1979 after Doris Mager spent six days and 5 nights in an abandoned eagle's nest to raise awareness of the difficulties faced by the bald eagle. Five months later the center opened and by the end of the year had admitted 66 rescued raptors. Today the Center treats almost 700 birds a year. On our visit, we immediately met "Trouble" a male bald eagle with a twisted beak suffered as a result of early trauma or from a birth defect. He was handled by a slight young girl who we later watched in a video explain how they take care of the birds at the center. An older lady briefly presented a beautiful owl before running off to treat a Red Tailed Hawk that had just been rescued. 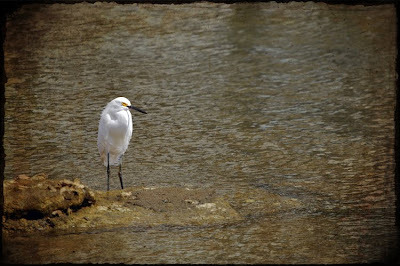 Bird holding areas are called "Mews"
For me nothing beats observing these wild animals in their natural environments. But I gain a whole new level of appreciation seeing them up close. Actually, seeing them in captivity increases my desire to go bird watching in some our state's great natural areas. We are fortunate to have a place that is able to care for and rehabilitate these majestic creatures. But we are even more fortunate to live in a state that still has enough habitat left to see them where they belong, in the wild. The story of the Turnbull Colony in New Smyrna Beach is one of hardships caused by "weather, insects, Illness, and overwork." 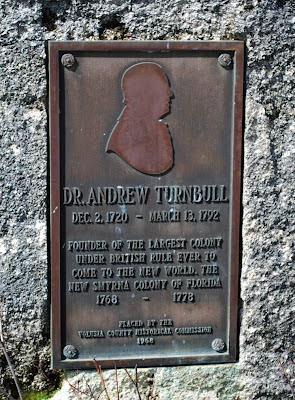 A plaque at Old Fort Park near downtown NSB tells the story this way: "During Florida's British Colonial Period, 1763-1783, Doctor Andrew Turnbull, established the largest North American colony at this site. Approximately 1800 Minorcans, Greeks and Italians comprised the colony named after Smyrna, Asia Minor, the birthplace of Dr. Turnbull's wife. 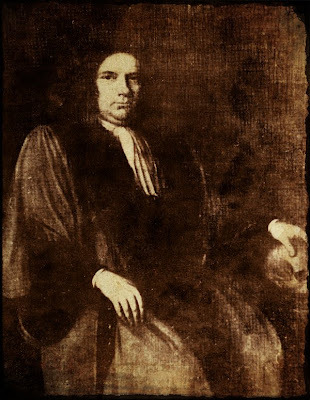 The colony experienced success in producing indigo dye, rice, hemp, and other crops for shipment to England. Buildings, wharfs and a canal system, still visible today, were constructed. 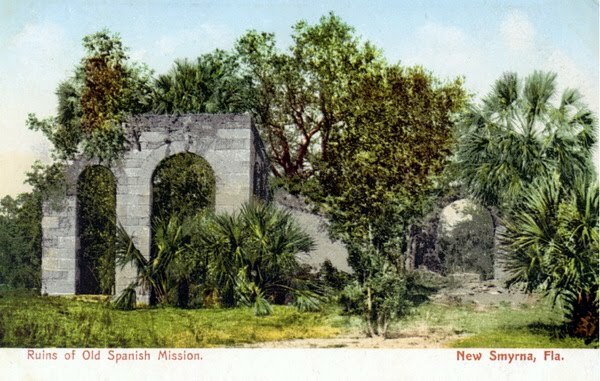 Despite successes, after nine years, the colony failed, approximately 600 survivors of the colony relocated to St. Augustine where many descendants reside." What the plaque doesn't say is that the colony was set up for 500 settlers not 1,800, and from the moment they arrived in North America there were issues. 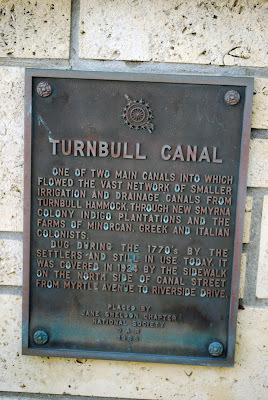 The Volusia County website says the "mix of ethnic groups, with their different languages and customs, as well as problems with Indians, also made matters desperate" and "Turnbull's inability to produce marketable crops in quantities large enough to satisfy his investors cost him their support, as well as that of the British government." 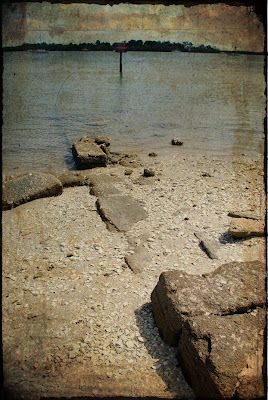 The casual beachgoer visiting New Smyrna for the day may pass within yards of the archeological evidence of the Turnbull Colony without even recognizing it. 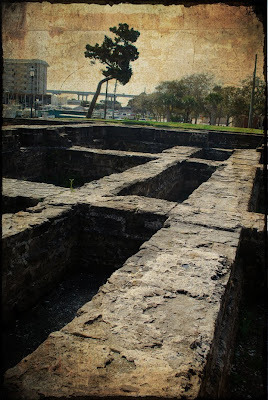 The most obvious example is Old Fort Park, the foundation of a coquina structure built by the colonists. Set on the site of an Indian shell mound, the “fort” was excavated and restored by WPA workers in 1933. 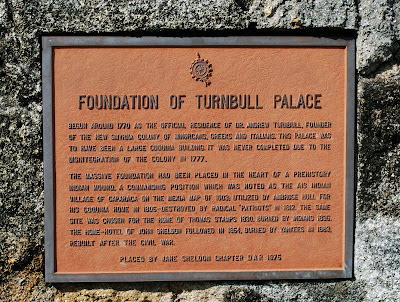 While it is called a fort, the ruins are also said to be of Turnbull’s mansion, among other theories, and the exact nature of their original purpose are still uncertain today. Two blocks South of the fort beneath New Smyrna’s charming downtown lies one of the several canals created by the colonists. 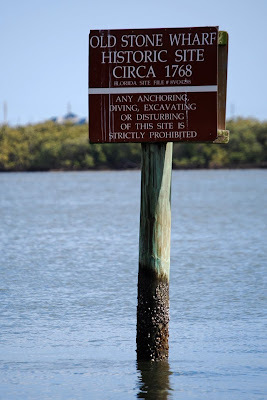 Dug by hand and lined with coquina, a system of waterways was created for agricultural purposes beginning in 1768. While the Canal Street water passage is only visible west of US 1 for the most part, other canals are clearly visible at the boundary between the towns of New Smyrna and Edgewater and running through the park on Myrtle Avenue. On the other side of SR 44 from Canal Street along Riverside Drive, the remains of Turnbull’s Old Stone Wharf are visible at low tide. 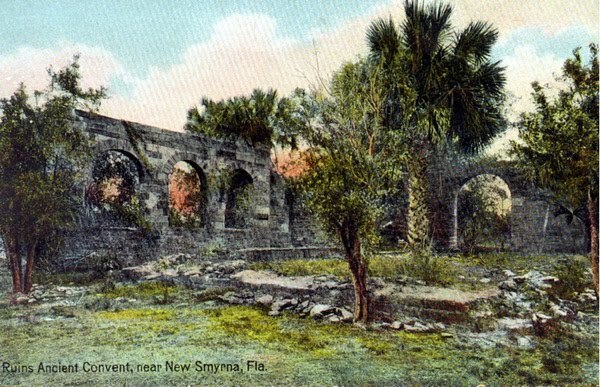 Said to be the first public works program for the colony, the wharf was located at the end of the King’s Road that connected New Smyrna to St. Augustine. To learn more about the Turnbull Colony, visit the The New Smyrna Museum of History at 120 Sams Avenue just off Canal Street. They have a fascinating exhibit with rare artifacts that help tell the story of what life was like in colonial Florida. 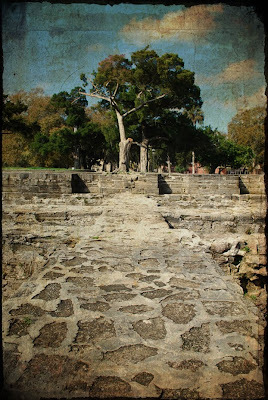 New pieces of the puzzle are being uncovered continuously as archeological research into the colony is still ongoing. Researchers are delving through records in Scotland, Turnbull's home at this moment, through records that have been sealed for over two centuries. Stay tuned as the story is sure to change! After two solid days of rain in an uncharacteristically cold winter we finally had the kind of great weather our state is known for (hence the Central Florida cities named Winter Park, Winter Haven, Winter Springs and Winter Garden.) I had to make a trip to New Symrna to take photos for an article about the Turnbull colony (future post) so I got on the road as early as I could. Nothing makes me happier than a road trip – no matter how far away I'm are going, I just like to get out and discover new stuff. About an hour away, New Smyrna is my favorite Central Florida beach town, although on this day I never got near the ocean. I spent most of the day in the historic downtown area to the west of the river. 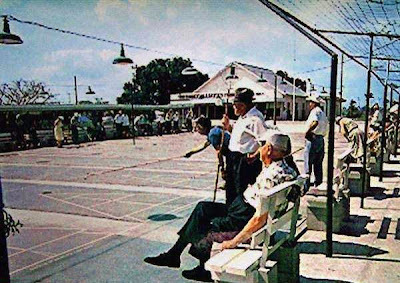 After shooting some of the archeological sites I found New Smyrna's shuffleboard courts which appear to still be in use by the Mainland Shuffleboard club. Next door is the New Smyrna Museum of History which was small but interesting and very helpful to my research. In addition to a new display on the Turnbull colony, they had an interesting exhibit on an attempt to re-create the Hollywood Walk of Fame in New Smyrna in the early 2oth century. This story was almost lost until the autographed concrete blocks with footprints from big stars like Charlie Chaplin and Laurel and Hardy were recently rescued from the dump! Just beyond the museum lies the Canal Street Historic District with antique shops, great historic commercial architecture, restaurants and galleries. Here are some of my favorite sights from the area. I found this place with wonderfully distressed type a couple blocks off Canal Street. This re-purposed gas station is between Canal Street and the Arts on Douglas gallery. Veterans Memorial in Riverside Park. This mid-century modern marvel is the Volusia County Courthouse Annex. This Art Moderne beauty houses the Chamber of Commerce. 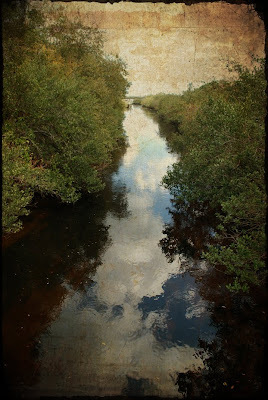 The artwork seen here is by Harold Garde, a well known artist who splits his time between New Smyrna Beach and Maine. It is displayed in the lobby of architect Kevin Schweizer, son of Frank Lloyd Wright protege Nils Schweizer. Apparently there is a classic car show running the length of Canal Street once a month. My absolute favorite place on Canal Street is Little Drugs because of its original soda fountain. Here's a little history from their website: "Little Drug Company, Inc has a long and illustrious history since its beginning in 1920. That was the year Bush-Little Drug Company opened on the northern end of Canal Street. In 1922 Mr. Little bought the business from Mrs. Bush and it became Little Drug Company, relocating to 501 Canal Street. In November of 1965 Little Drug moved across the street to the former Victoria Theater building where it is currently located." While the food is pretty standard, the milkshakes are the great old fashioned kind, made by hand, served with chocolate syrup and then they give you whats left over in the metal mixing cup. Very few places are left like this in Florida and a milkshake here alone is worth the hour drive over. Just outside of the historic area, this giant can of paint with a brush on top is located on US 1. 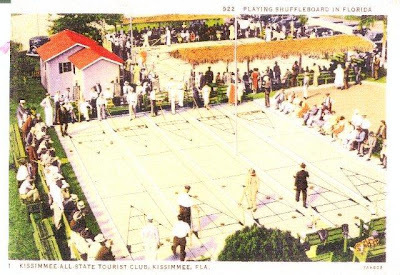 Since my last post on Kissimmee's KAST club's shuffleboard courts, much has happened but the outcome still seems to be the same, the clubs's last day on the property is to be March 17th. "Thank you for thinking of the KAST Club. Although the building and courts and cover are going to be demolished, the members voted to keep the club together. We're not able to say where we will meet, but hope and pray that something will turn up. Our new officers are being installed during the meeting at this time... Our club was declining in numbers and that didn't help us at all. In spite of the city situation and progress they have made, we have one member who is still fighting the city and doing all he can. Just a shame he didn't start a few years ago." 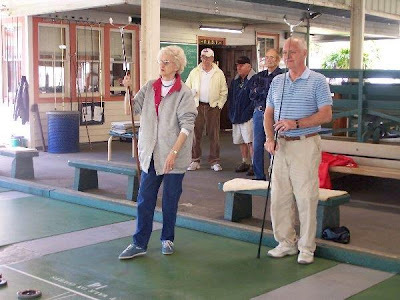 "In 2005, when it was becoming clear that the St. Petersburg Shuffleboard Club property was being viewed by City 'leaders' as a development site (library, college, etc), a group of us got together. 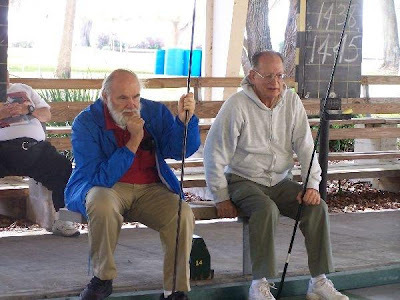 It was clear to us that the seniors at the St. Pete Club weren't able to put together a campaign to counter a proposal and frankly, with the Club size as it was, there was little chance that the City would listen. We decided that rather than wait until the proposal came (and then laying down in front of bulldozers) we would proactively invite the community to visit and to use the facility for its intended purpose. 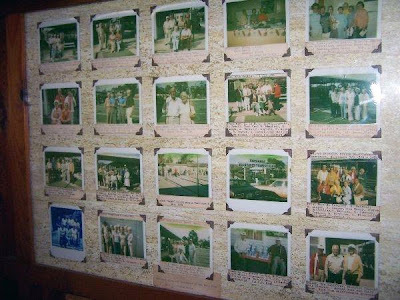 A group of friends (artists, neighborhood activists), all in our thirties and forties sat at my dining table one Saturday and we put together every idea for public events that we could think of (art shows, concerts, food, barbeque, Fourth of July, glow in the dark shuffle, etc.) and then voted on which ideas were common priorities to try out. It turned out that the one idea that everyone wanted to put energy into was to open the Club to the public from 6-10 (we now run 7-11), every Friday night. 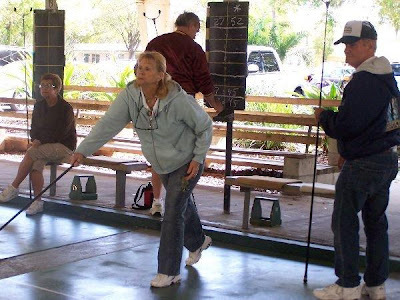 We call the event the St. Pete Shuffle and it has brought thousands of people, (St. Pete residents and visitors, tourists and families,) to the Club, has fed us new memberships, volunteers and publicity. Shuffle has been covered in the NY Times, Washington Post, Southern Living Magazine and lots of other media outlets. We've done all those other ideas as well, and repeat some of them regularly. They allowed us to forge friendships with arts groups, restaurants, scout troops, a Folk Fair society, old car buffs and more. 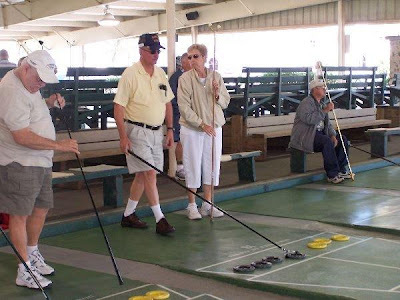 As a result of those efforts and outreach, at some point in 2008 City of St. Petersburg 'leaders' realized that the best use of the Shuffleboard Club was... as a shuffleboard club. By this time, if a redevelopment proposal was forthcoming, the Club was in a much stronger position to respond, negotiate or raise a ruckus. Instead, the City budgeted $750,000 to take care of long deferred maintenance issues and restore the buildings last year. In November 2009 we had a formal reopening celebration.... all as a result of our Friday night 'Shuffle'. I don't know if there's much time left to try something similar in Kissimmee, or if your members, neighbors and the surrounding community want to. It would take much the same collaboration as worked here, with Shufflers, Historic Preservationists, Artists, Neighbors and creative folks all needing to be identified quickly. 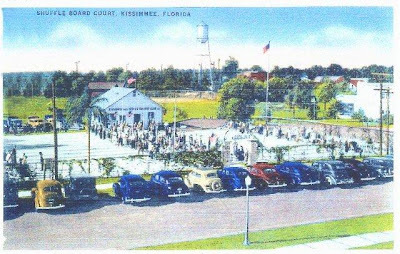 If they do, I'd be glad to discuss the idea further....Florida was blessed in the last century to have residents who, together, built wonderful recreation facilities. I hope the residents in this century begin to value those grounds appropriately." Dot responded that it was too late and that only one member was still fighting what now seems inevitable. Yesterday the National Trust for Historic Preservation did a story on its website about the loss of the courts and quoted KAST club member Gerald Lemenager stating "I'm still fighting it ... I know it won't do much good, but I'm going to keep putting my two cents in." It's a shame we didn't know about this sooner, as we might have made a difference. 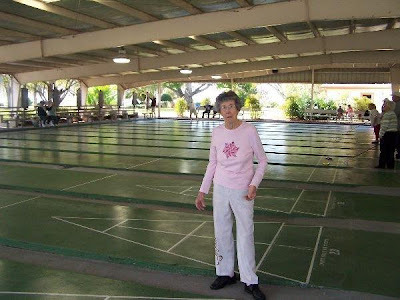 Still there are great shuffleboard facilities around the state sitting vacant. Perhaps it is time for the magic of the St. Pete Shuffle to spread to other cities. Can we spark a renaissance of the game that so many enjoyed throughout the last century in the Sunshine State?